This is no ordinary book about mushrooms. It is the story of the capricious and sought-after porcino. The mushroom to which people in North Italy give their lives each autumn, simply in an attempt to find it. The mushroom that Karl XIV Johan, King of Sweden and Norway, lifted aloft and gave his name to forever. The mushroom that gives poor Chinese farmers and American dropouts a better life and that enjoy a global market worth over a billion Euros. The mushroom that the Romans loved and which has become an important part of the Italian identity. Karlsen travels around three continents to collect secrets and suggestions from the best porcino pickers in the world. He combines them with curiosity, cultural and historical anedoctes and delicious recipes in a book which gives a complete overview on the history and uses of the gourmets most prized mushroom. No one cultivates it, though many have tried. The porcino will not be tamed. It is born to be wild. NORLA, Norwegian literature abroad, a government-funded, non-commercial foundation which promotes norwegian literature to other countries, selected Steinsoppen. Villa v natur for a special presentation at the Frankfurt Book fair in October 2014. For this titel NORLA provides translation and production subsidies to foreign publishers. The Author is willing to modify his work according to national preferences. 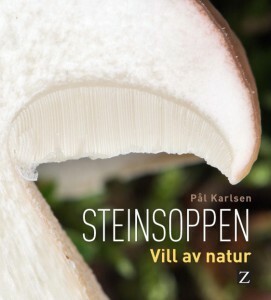 The author: Pål Karlsen (1960) has been interested in mushrooms ever since joining mushroom forays as a boy. In 2007, he became a certified mushroom expert and he now leads Oslo Society for Mushrooms and Wild Food Plants. He is also the editor of Sopp og nyttevekster, the member’s magazine of the Norwegian Association for Mushrooms and Wild Food Plants. He has formerly published a text book on film production and is by profession afilm producer specialized in educational films.